The Black Hills area of western South Dakota has a history of damaging flash floods that have resulted primarily from exceptionally strong rain-producing thunderstorms. The best known example is the catastrophic storm system of June 9–10, 1972, which caused severe flooding in several major drainages near Rapid City and resulted in 238 deaths. More recently, severe thunderstorms caused flash flooding near Piedmont and Hermosa on August 17, 2007. Obtaining a thorough understanding of peak-flow characteristics for low-probability floods will require a comprehensive long-term approach involving (1) documentation of scientific information for extreme events such as these; (2) long-term collection of systematic peak-flow records; and (3) regional assessments of a wide variety of peak-flow information. 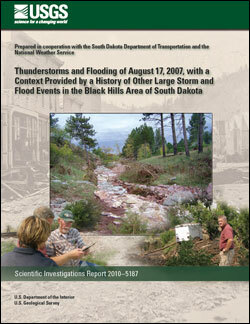 To that end, the U.S. Geological Survey cooperated with the South Dakota Department of Transportation and National Weather Service to produce this report, which provides documentation regarding the August 17, 2007, storm and associated flooding and provides a context through examination of other large storm and flood events in the Black Hills area. The area affected by the August 17, 2007, storms and associated flooding generally was within the area affected by the larger storm of June 9–10, 1972. The maximum observed 2007 precipitation totals of between 10.00 and 10.50 inches occurred within about 2–3 hours in a small area about 5 miles west of Hermosa. The maximum documented precipitation amount in 1972 was 15.0 inches, and precipitation totals of 10.0 inches or more were documented for 34 locations within an area of about 76 square miles. A peak flow of less than 1 cubic foot per second occurred upstream from the 2007 storm extent for streamflow-gaging station 06404000 (Battle Creek near Keystone); whereas, the 1972 peak flow of 26,200 cubic feet per second was large, relative to the drainage area of only 58.6 square miles. Farther downstream along Battle Creek, a 2007 flow of 26,000 cubic feet per second was generated entirely within an intervening drainage area of only 44.4 square miles. An especially large flow of 44,100 cubic feet per second was documented for this location in 1972. The 2007 peak flow of 18,600 cubic feet per second for Battle Creek at Hermosa (station 06406000) was only slightly smaller than the 1972 peak flow of 21,400 cubic feet per second. Peak-flow values from 2007 for three sites with small drainage areas (less than 1.0 square mile) plot close to a regional envelope curve, indicating exceptionally large flow values, relative to drainage area. Physiographic factors that affect flooding in the area were examined. The limestone headwater hydrogeologic setting (within and near the Limestone Plateau area on the western flank of the Black Hills) has distinctively suppressed peak-flow characteristics for small recurrence intervals. Uncertainty is large, however, regarding characteristics for large recurrence intervals (low-probability floods) because of a dearth of information regarding the potential for generation of exceptionally strong rain-producing thunderstorms. In contrast, the greatest potential for exceptionally damaging floods is around the flanks of the rest of the Black Hills area because of steep topography and limited potential for attenuation of flood peaks in narrow canyons. Climatological factors that affect area flooding also were examined. Area thunderstorms are largely terrain-driven, especially with respect to their requisite upward motion, which can be initiated by orographic lifting effects, thermally enhanced circulations, and obstacle effects. Several other meteorological processes are influential in the development of especially heavy precipitation for the area, including storm cell training, storm anchoring or regeneration, storm mergers, supercell development, and weak upper-level air flow. A composite of storm total precipitation amounts for 13 recent individual storm events indicates (1) a propensity for heavy precipitation to occur east of the major axis of the Black Hills, from the northern hills (near Spearfish) toward the southeast through the eastern foothills near Hermosa, and (2) a proclivity for short-duration but intense convective precipitation events. The largest gradients in topography lie along the foothills, as opposed to over the higher altitudes, and this helps favor heavy precipitation. Additionally, a pronounced escarpment with several hundred feet of relief exists along the eastern edge of the Limestone Plateau, and orographic lifting associated with this escarpment can occur with a southeasterly air flow. However, to the west of this escarpment, relief is relatively small and localized, and the potential for orographic lifting is minimal. Moreover, moisture-laden air masses mostly originate from the Gulf of Mexico, which strongly affects the eastern Black Hills. Finally, the westerly mean air flow causes storm complexes to drift eastward, which generally coincides with a down-basin direction for most drainages along the eastern flanks of the Black Hills, and also favors convergent patterns along the eastern slopes of the Black Hills. Collectively these factors enhance the probability of exceptional rainstorms along the eastern Black Hills, relative to the highest terrain. A chronology of historical storm and flood events was examined to provide a context regarding exceptional events for the Black Hills area. Consideration of the comprehensive flood history indicated that most of the especially large flows for smaller drainages in the Black Hills area have resulted from strong thunderstorms, rather than from more general storm systems. Of the 13 events that were included in a climatological analysis of recent large area storms, 10 occurred between late May through early July, which probably is reasonably representative of most of the strong localized storm events contained in a tabulation of historical storm and flood accounts. In contrast, many of the large storm and flood events for the Fall River have occurred in August and September. Statistical analyses of peak-flow trends were performed for two streamflow-gaging stations, and a statistically significant trend (downward) was quantified for one (station 06402500 along Beaver Creek). However, consideration of historical flood accounts qualitatively supports a hypothesis that exceptionally large flood events may be somewhat "under-represented" in peak-flow records subsequent to 1972 (which includes a preponderance of modern peak-flow records) for relatively small area drainages that include the Fall River, Beaver Creek, Rapid Creek, Spearfish Creek, Whitewood Creek, and Bear Butte Creek. The combination of climatological factors, systematic peak-flow records, and historical accounts strongly supports a conclusion that potential for generation of exceptional thunderstorms is much smaller west of the major axis of the Black Hills than east of the axis, especially relative to areas with the most robust history of large-scale events along the eastern flank. For areas just east of the escarpment that lies along the eastern extent of the Limestone Plateau, accounts of large peak-flow events are not completely absent, but generally are sparse relative to records and historical accounts for areas around the periphery of the Black Hills. A conclusion of increased potential for especially heavy precipitation from convective storms, relative to areas west of the escarpment, is strongly supported by systematic records, historical accounts, and climatological theory. Drainages within the northern Black Hills were qualitatively determined to be considerably more subject to effects from wet antecedent conditions (including snowpack) and from storms involving prolonged precipitation than drainages within the central and southern Black Hills. Final interpretations are offered that further refine the potential for exceptionally strong storms and associated flooding. Storm and flood potential are smallest on the relatively flat top of the Limestone Plateau, but increase in southerly and northerly directions commensurate with increasing topographic relief. Storm and flood potential also increase in easterly and westerly directions owing primarily to increasing relief. Storm and flood potential are largest along the eastern and northeastern flanks of the Black Hills, with maximum flood potential occurring in confined canyons with especially steep topography nearby. Storm potential generally decreases in moving around the periphery of the Black Hills towards the western flank because of reduced potential for orographic lifting and decreasing effects from moistureladen air masses originating from the Gulf of Mexico. Driscoll, D.G., Bunkers, M.J., Carter, J.M., Stamm, J.F., and Williamson, J.E., 2010, Thunderstorms and flooding of August 17, 2007, with a context provided by a history of other large storm and flood events in the Black Hills area of South Dakota: U.S. Geological Survey Scientific Investigations Report 2010-5187, 139 p.